Neck – light or dark? In a previous post, I expressed some doubt about my choice of neck for this guitar. The Macassar Ebony wood is magnificent but it seems like it might be a little too magnificent for this guitar project, distracting from the equally magnificent body. I am currently planning guitar #3, also a Telecaster but in a different vein, and I happen to have the neck for that guitar already in my possession, and it is a two piece maple neck, also from Warmoth. 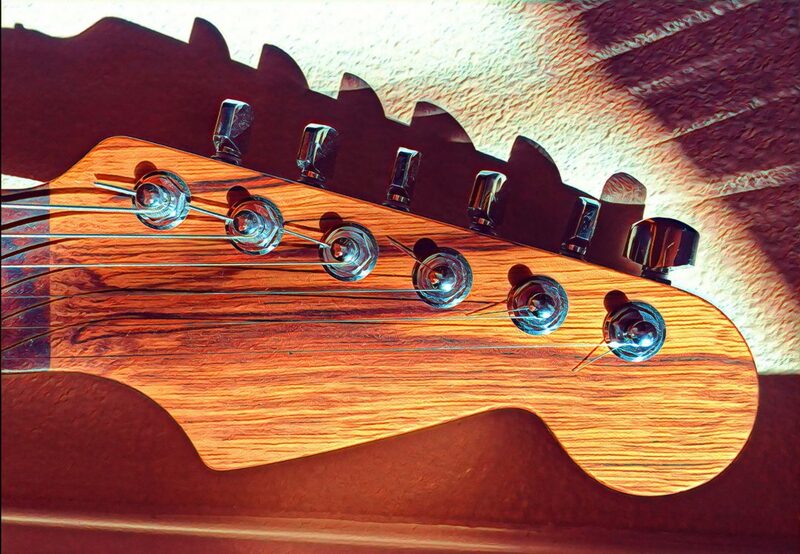 So just for fun, I took photos of the guitar with the dark neck and the maple neck. Both are below. I think it is pretty clear the maple neck looks, uh, inappropriate. But just for the vicarious thrill of it, here they are. I took these on my front step and the cardboard is only there to protect the body from the concrete. What do you think? I plan to go with the dark neck. I think with the tuners and strings installed, the extra chrome will reduce the shock value of the maple headstock and it will look OK.